Every year at the winter solstice, usually December 21st, sheep horns (and for that matter all heritage sheep and other mammals’ horns as far as I have been able to determine) begin growing, a process that lasts for about three months and then tapers off through the spring and stops until the next December. To support this growth, vascularization within the horns, and thus the blood flow through the inner sheath of the horn, increases dramatically, then recedes as growth stops. 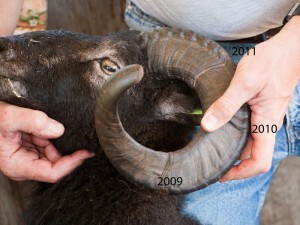 Growth occurs at the point where the horn grows out of the head. 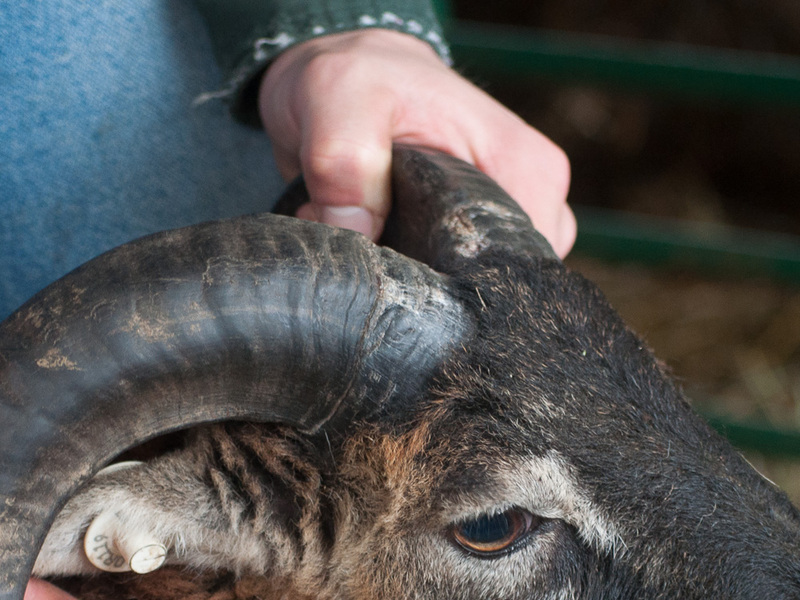 Most of our Soay rams, including Buckley, display a distinct new “ring” each year at the point on the horn where the new growth began. Fellow shepherds, we need to be careful not to pull on our animals’ horns — either rams or ewes — during horn growth, since they are somewhat fragile. The layer of tissue between the bone and the hard outer keratinous sheath softens, vascularizes, grows and swells, basically pushing the outer shell out before the new growth hardens. If you hold one of the sheep and gently wiggle its horn, you can feel that it is not tight. It’s okay to hold the horn, but if you pull out on it you may cause the sheath to tear loose. Fortunately, while the horn is growing the rams have finished their seasonal fighting (rut) and have resumed their off-season, slothful behavior, pretty much ignoring each other. Once growth slows down each spring, the new tissue firms up and the risk of breakage at the base also subsides. 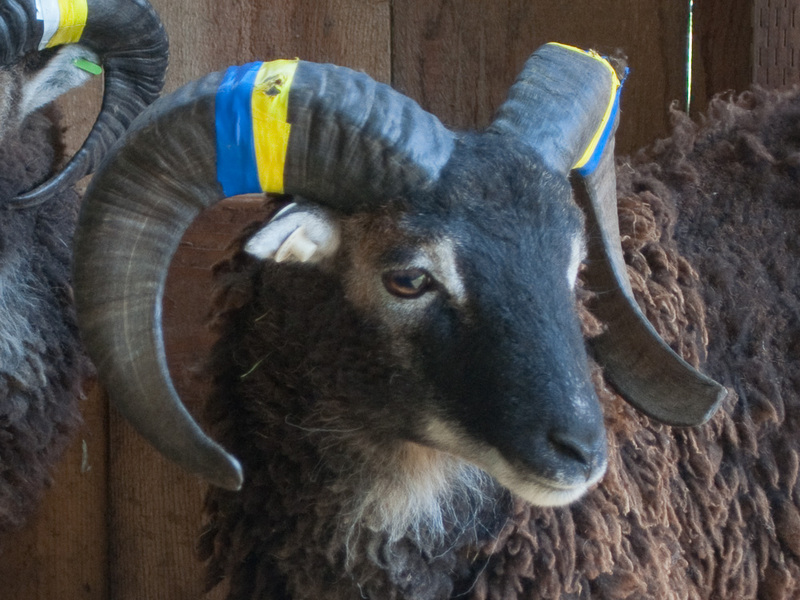 Another cautionary note: If a ram’s horns grow toward his neck, or pass tightly past his neck, the growing horn may start impinging on his neck and may need to be cut. 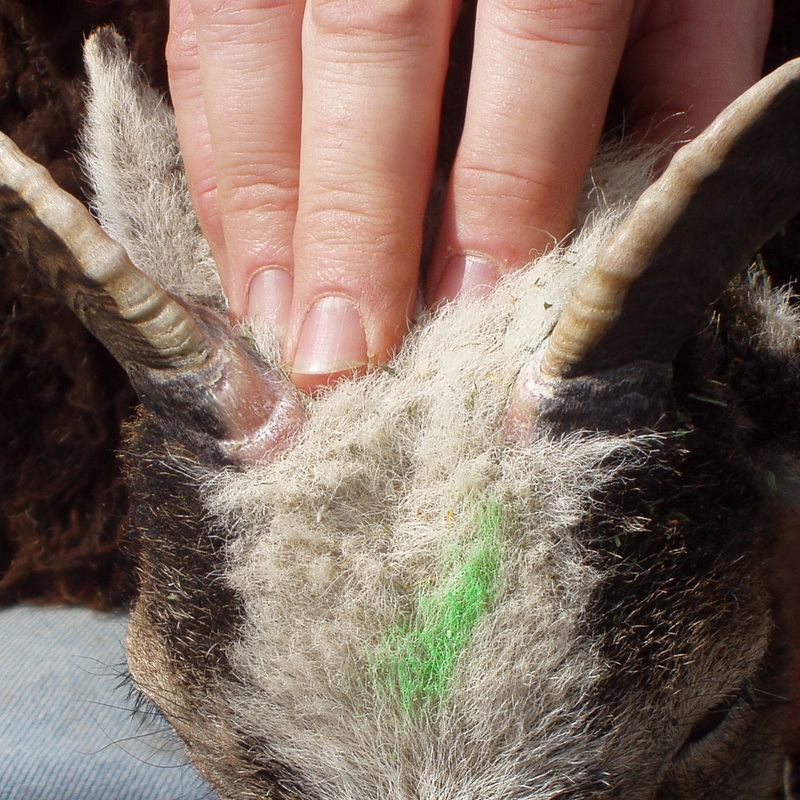 Horns should be checked at least once during the January-late spring growth cycle. Usually if horns in a more typical spiral have cleared the neck, they will continue to do so. But occasionally, even after several years of perfectly safe growth, a mature adult ram’s horns will suddenly shift tighter during a growth cycle and need to be cut. 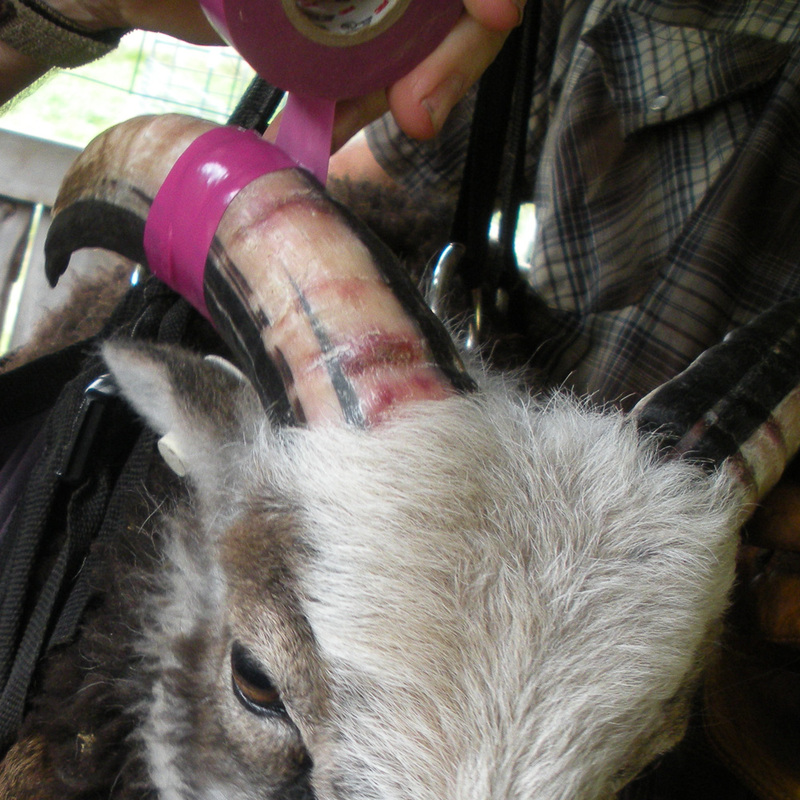 Because this happened to us a few years ago with Haines, a middle-aged ram, we now check all our adult rams’ horns during February and if necessary again in March just to be on the safe side. As I was inserting the first picture of Caldecote into this post, I marveled again at what huge wide horns he had as a teenager, so much so that I went back and found this second picture of him taken just seven months later as he was being inspected to leave the farm. If he hadn’t been horn-taped, I would not have believed the date on the picture. I don’t think I’ve ever seen so much horn growth on a ram in such a short time, but maybe I wasn’t paying attention. Now I’m wondering if it is typical. Hmm. 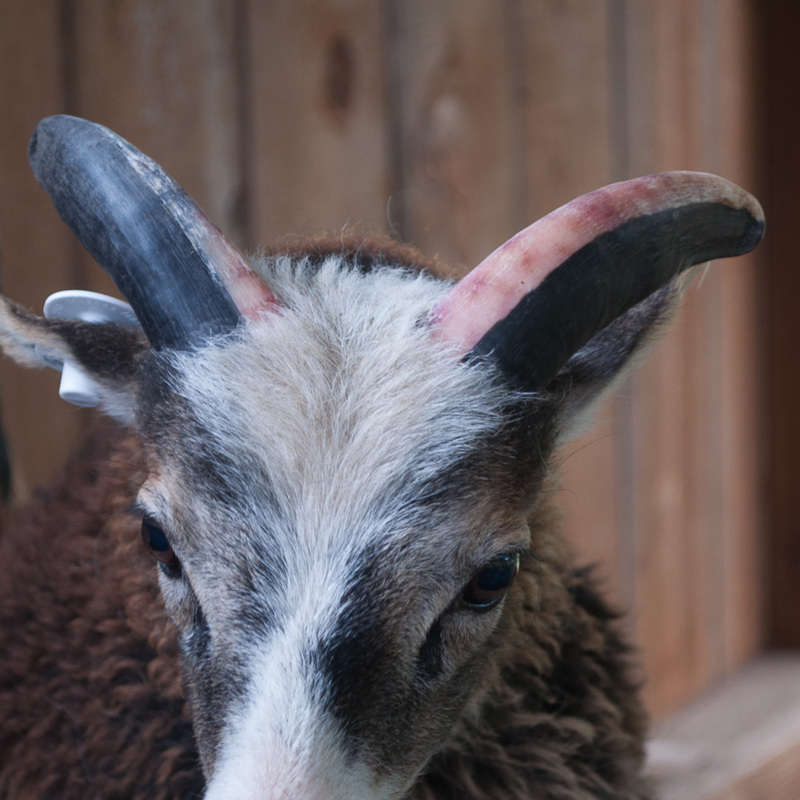 If you are curious about the horn growth cycle and process, and you have any white-spotted sheep with at least partially white horns, they will provide you with a walking demonstration. And it doesn’t matter whether the animal is a ewe or a ram. All of their horns grow each year. Recall an animal expressing the white-spotting gene (“ss”) has white spots in places on its body where there is an absence of pigment. Similarly, the portion of an “ss” animal’s horn that is white also lacks pigment and appears translucent. That means during annual horn growth, the increased blood flow shows through the horn as pink. 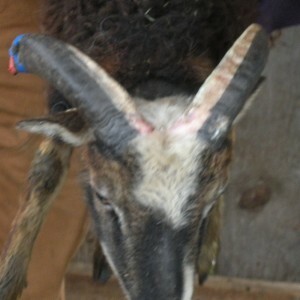 Ellerbeck’s horns nearing the end of her first annual growth cycle, photo taken on March 1, 2008. See the pink area at the growth point? If you are a new Soay sheep breeder, you do not need to wait until your lambs mature to see the same phenomenon in action. For the first several months of a lamb’s life, its horns grow more or less continuously. For the majority of lambs who are brown and have brown horns, the only visible manifestation of this early growth is the lengthening of the horns, a subtle process that is pretty ho-hum. But the first time you see a “pink” horn on one of your lambs can be somewhat disconcerting. Once you get used to it, you find yourself watching for it during the winter when there’s not much else going on. How easily entertained shepherds are, or at least this one is. 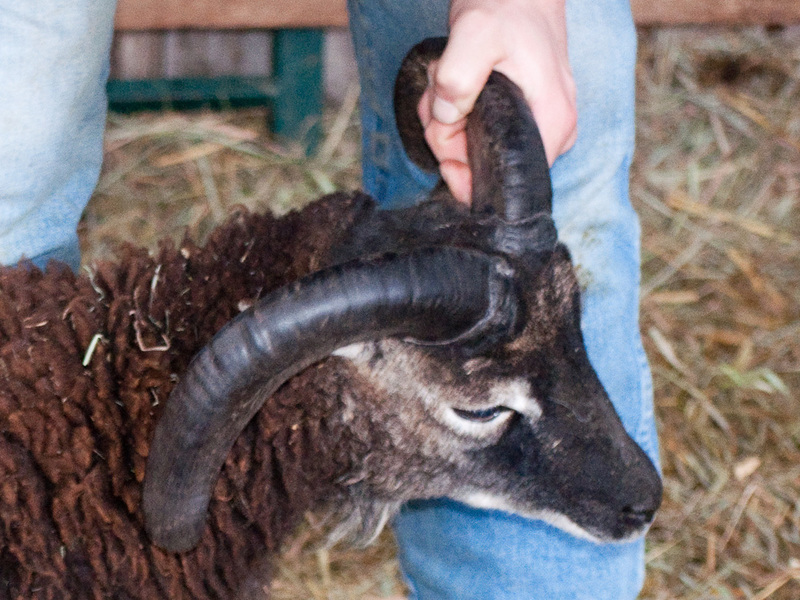 « Exploring and exploding myths about Soay sheep: Can they be herded?